The player-manager is practically an extinct species nowadays, but not so long ago they were the in-vogue thing and it seemed that every second or third club had to have one. The current day demands involved in being in charge of any professional club mean that the days of seeing a host of gaffers lace up their boots and take to the field are long gone and unlikely to return. 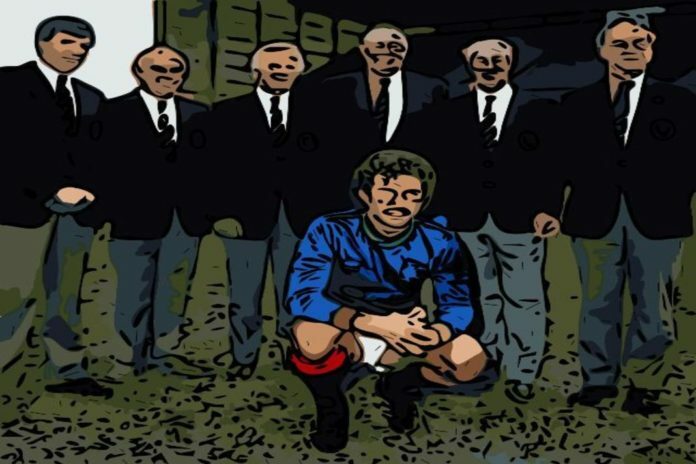 It is a bit of a shame really, because those of us of a certain vintage can well remember the days when Kenny Dalglish, Graeme Souness, Peter Reid and others not only picked themselves on a regular basis, but also were invariably the best players on the pitch. In years gone by, the lower leagues always had a fair sprinkling of player-managers. This was because hiring a young manager who could continue playing was often seen as a way to cut down on costs while maintaining a bit of class of the field. However, with few exceptions the PM was rarely seen in the top flight until the mid-1980’s. One such exception, though, was at West Brom where Johnny Giles played and managed Albion to promotion from the Second Division in 1976 and then continued to don his boots during their first season back in the top flight. Indeed, Johnny seemed to enjoy being PM so much that he doubled up in the role with the Republic of Ireland national team at the same time, and upon leaving the Hawthorns in spring 1977, he continued to carry out both duties in his next post at Shamrock Rovers. Nevertheless, Giles was rather the exception to the rule until the summer of 1985. In the post-Heysel fog and trauma, Liverpool announced that the outgoing boss, Joe Fagan, would be replaced by the inexperienced playing legend, Kenny Dalglish, who would combine playing with managing. Many an eyebrow was raised in surprise at the time, and many a commentator mused out loud the wisdom of entrusting the running of a club the size of Liverpool to a 34-year-old novice who intended to keep playing. Twelve months later with the league and cup trophies safely under lock and key, the same experts were forced to eat a reasonable degree of humble pie. To be fair to the doubters, Dalglish had never previously expressed an interest in management and his appointment came as a surprise to the majority of his team mates as well as the football world at large. Taking to the job fairly smoothly, Dalglish later stated his main difficulties had come in separating himself from the camaraderie of the dressing been room as a manager, while still needing to integrate himself as a player. Dalglish’s initial success as PM at Liverpool could have been instrumental in opening the eyes and ears of the chairmen at other clubs, because over the next few years a sudden influx of such appointments seemed to flood the top two flights and beyond. Dalglish’s old Liverpool roommate, Graeme Souness, was appointed as PM of Glasgow Rangers a year later and, like Dalglish, would go on to have enormous success in the early years of his management career. The first few years of which he spent as much time on the field as in the dug out. Perhaps the success Dalglish and Souness achieved as player-managers came about partly because they were still outstanding players at the time. When they moved into management they still contributed massively on the park and invariably made their sides better. In addition, there is no doubt that their playing records commanded the respect of those they lined up with on the field, and so perhaps also inspired others around them. It is interesting to note, though, that neither Dalglish nor Souness really enjoyed the same success in management after they had been retired as players for more than a couple of years. Towards the end of the 1980’s and into the early ‘90’s other clubs started giving the PM concept a whirl. Trevor Francis took over as player-boss at QPR in late 1988 and spent a year or so falling out with all around him before getting the sack and being signed as a player by Ron Atkinson at Sheffield Wednesday. When Atkinson left Hillsborough to take the Aston Villa job in 1991, Francis got his second bite at the PM cherry, and this time proceeded to make a better fist of it. A third-place finish in the old First Division was achieved in his first season in charge, and this was followed up by four Wembley appearances the next season as Wednesday made it to the finals of both domestic cup competitions. Around the same time, Peter Reid took over at Manchester City and turned out throughout his entire three-year tenure as player-boss. Never the most mobile of players in the first place, Reid seemed cut out for the dual role as he was able to sit in the centre of the park not only dictating play, but also reading the game perfectly. This meant that he was possibly unique in actually being a better manager when he was on the pitch than when he was off it. Glenn Hoddle was another player who moved seamlessly into managing, and like Trevor Francis and Johnny Giles, he too was PM at more than one club. After taking over at Swindon and leading them into the promised land of the Premier League, he left to take over at and play for Chelsea. Some cup success led Hoddle to become only the second ever PM (after Dalglish) to appear in an FA Cup Final when he came on as a substitute in Chelsea’s 1994 defeat to Manchester United. This was a feat the ever-lovely Dennis Wise emulated ten years later with Millwall. Hoddle, however, seemed to struggle a little as player-manager at Chelsea, and sometimes appeared to fall between two stools. At Swindon in the second flight he was invariably the best player in the side, but at Chelsea with the step up in divisions and expectations, his form as a player sometimes seemed to dip when the chips were down. It was perhaps for this reason he called it a day as a player a couple of years earlier than he would have otherwise done had he not been manager too. Other players fancied a go and some were more successful than others. England defender Terry Butcher was one of the more spectacular failures at Coventry City, while his old World Cup team mate, Peter Shilton, enjoyed limited success at Plymouth. QPR were not put off by the Trevor Francis experiment, and so gave the reigns to the really-and-not-said-in-an-ironic-way lovely Ray Wilkins in 1994 before giving him the sack two years later. Chelsea’s Hat-trick and Swindon’s Foursome! Chelsea actually went one better and employed three player-managers in a row, with Ruud Gullit following Hoddle into the hot seat when Glenn moved on up to England, and Gianluca Vialli taking over a year or so later. Gullit and Vialli were actually very successful as PMs, winning four trophies as PMs between them. Swindon in turn during one period had four player-managers who had each played in the final stages of the World Cup. First Lou Macari turned out for the Robins in a two-year spell; then it was Ossie Ardiles’ turn; Glenn Hoddle was next, of course, and, following a short spell when John Gorman took the reigns, it was over to ex-Liverpool and England man Steve McMahon to play two dozen games and win a promotion. Elsewhere also giving it a crack were Bryan Robson at Middlesborough, who secured promotion from the second flight while still playing, and Gordon Strachan at Coventry who became the Premier League’s oldest outfield player during his time in charge at Highfield Road. The last regular player-manager in the Premier League was Vialli at Chelsea, and since then only a handful of men have even been nominal player-managers. Garry Monk and Leon Britton were named as player-managers of Swansea on separate occasions but made limited, if any, playing appearances. Stuart McCall was similarly placed in temporary charge of Bradford City while still playing in 2000, and most famously of all, Ryan Giggs made one appearance as caretaker player-manager of Manchester United in 2014. The days of players stepping straight into management positions in the top flight, whether continuing to play or not, are likely to remain a thing of the past. Nowadays there are regulations that state managers must have coaching qualifications in order to operate at the top levels. It takes more than five hundred hours to complete UEFA A, B and Pro Licence badges and players normally just do not have the time to do so whilst still playing. Perhaps this is not totally a bad thing if it prevents the scenario of Mark Hately’s time in charge of Hull City from ever being repeated. Upon taking over as manager, Hately is said to have insisted on a clause in his contract regarding appearance money. This led to a rash of mysterious late substitutions when the aged manager would put himself on for the last couple of minutes, once, allegedly, even while carrying an injury and barely able to hobble, let alone run.